Swedish Cucumber with Dill is fresh, light and full of sweet, tart flavor. We added quick pickled red onions to ours for color and flavor. Make it alongside Swedish meatballs, or anytime you need a quick, delicious salad. Cucumbers are one of our favorite vegetables and we make some form of quick pickles at least once a week, if not more. I love them Asian-style, with rice vinegar and toasted sesame oil, especially along with Vietnamese-style Baked Chicken or any roasted meat. When we decided to make Swedish Meatballs, I knew we had to also make the traditional side dish, a sweet and sour quick-pickled Swedish cucumber salad flavored with dill. We added red onions, because they add great flavor and color to the dish. If onions are not your thing, feel free to leave them out and just serve the cucumbers on their own. We recommend using small Persian cucumbers because they have very few seeds and are fantastically crisp. English cucumbers would also work well because the have unwaxed skin and very few seeds. If using regular cucumbers, you’ll need to peel the waxy skin, slice it in half length-wise and scoop out the seeds with a spoon before thinly slicing. 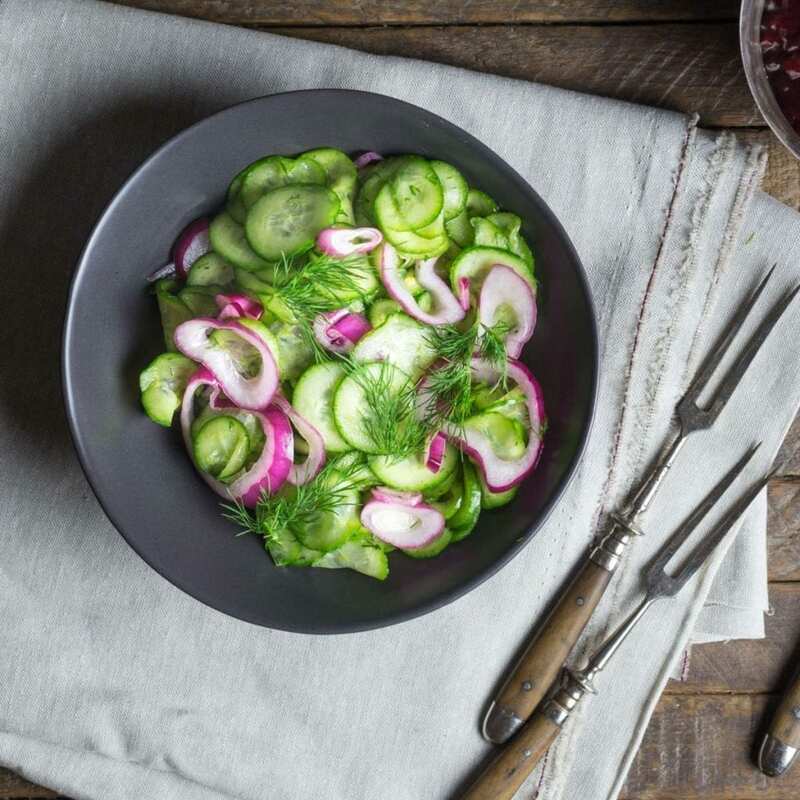 Swedish Cucumber and Red Onion Salad with Dill is the traditional accompaniment to meatballs and gravy. Boil 4 cups of water in a pot or kettle. Add red onions to a fine meshed sieve and place in the sink. Slowly pour the boiling water over the onions to soften them. Set aside. In a medium bowl, stir together vinegar, water, salt, sugar, and dill. Stir in the cucumbers and softened onions. Cover with plastic wrap, and let stand at room temperature for at least 30 minutes, or refrigerated up to a day. Very nice, fresh accompaniment to Swedish meatballs.